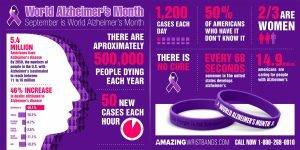 Design burgundy wristbands to show your support for World Alzheimer’s Month. This year marks the fifth for World Alzheimer’s Month, which is a chance to raise awareness about this disease and to show support for those who suffer from it as well as their caretakers and families. During this awareness month, organizers hope that people will learn more about the disease and break down stigmas that currently surround it. The awareness period lasts a month in the hope that Alzheimer’s associations worldwide will have more time to extend the reach of their events and programs. Alzheimer’s disease is a type of dementia. According to Alzheimer’s Disease International, the term “dementia” describes various brain disorders that impact memory, thinking, behavior, and emotion, and there are about 46 million people worldwide who live with it. Per the Alzheimer’s Association, this disease accounts for 60 to 80 percent of those living with dementia. Children and adults of all ages love wristbands—they’re colorful, charming, eclectic, and unique. Which is what makes wristbands a great addition to any event or campaign. Bracelets can be tailored to Alzheimer’s themes, and they can be used to raise funds for the association & survivors. Messages can be imprinted on the bracelets to make them particularly aligned with World Alzheimer’s Month; for example, they can say “Go Purple To Support Alzheimer's” or “Learn more about Alzheimer’s disease”. 100% silicone for your wristbands. Cool special effects such as swirled or segmented colors, glitter, or glow in the dark available. We do not charge a mold fee any quantity of custom wristbands. Do not require a minimum quantity for your order. Free shipping, free artwork, free design, and free color matching available. Can choose from different colors and color combinations. In addition to standard wristbands, we also offers super popular slap bands that “snap” to a person’s wrist, as well as thin half-inch bands, thicker one-inch bands, adjustable bands, USB bands, silicone rings, and silicone key chains. All our silicone products are made of 100% silicone so they are comfortable, durable, and non-allergenic. Build your own World Alzheimer’s Month wristbands online!